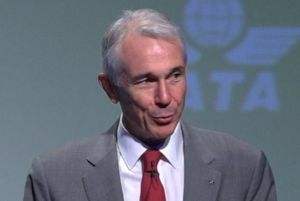 “IATA is strong and in a healthy state. This is a record attendance. My remarks will highlight key developments in the association and prioritise areas where your continued support is critical to our success. First, I would like to report on the growth and diversity of our membership. Since we last met, the IATA family has expanded to 264 airlines. IATA members come from 118 countries and together provide 83% of global traffic. We are truly the airline industry’s global trade association. One of IATA’s biggest responsibilities is managing your money. In 2015, IATA’s financial systems processed some US$363bn – a sum that is roughly equivalent to the GDP of Norway. Virtually 100% of all funds were delivered on time. And unrecovered debt was less than 0.025% of funds handled in the IATA Settlement Systems. IATA also works to help you to repatriate your money when it is blocked by governments. Total blocked funds now exceed US$5.5bn. And the top five countries involved are Venezuela, Nigeria, Sudan, Egypt, and Angola. The most severe example is Venezuela where some US$3.bn is trapped. While we have not been successful in clearing the amount despite great effort, I can report two significant steps. Last month we petitioned to have airline funds included by law in the national debt calculation, which should prioritise payment when funds are available. Shortly thereafter we applied to the US Department of Transportation for anti-trust immunity that would allow the airlines involved to discuss collective action with a view to finding ways to sustain viable air transportation to this very troubled country. In the case of Nigeria, in April I went personally to meet with vice-president Yemi Osinbajo to communicate the concern among airlines that the amount of blocked funds is nearing US$600 million. IATA continues its efforts to rebalance the value chain. A particular issue over the year has been in the Middle East. The lower oil price is tempting some governments to look for ways to make up for lost revenues. We are fighting charges increases there and elsewhere. And where governments have looked for alternative solutions, including privatisation, we are reminding them of the importance of effective regulation to avoid the mistakes that we have experienced elsewhere. We have also moved into new territory by filing as a complainant asking the European Commission to ensure that original equipment manufacturers (OEMs) do not abuse their dominant position in the after-market for maintenance services and spare parts. The costs are big and it’s essential that you pay a fair price. In recent years, I have made it a tradition to use this platform to bring to your attention areas where your help is critical to IATA delivering the results that you need and expect. I will continue that tradition this year”. Tyler highlighted ground safety, IATA’s Bank Settlement Plan (BSP) which handles US$230bn of member’s money, and improved business intelligence through IATA’s Direct Data Solutions (DDS), a potent source of industry-owned business intelligence. It is powered by information covering more than 90% of indirect ticket sales. And direct-sales data has reached coverage of 21%. He asked members to help by contributing data to this industry-owned solution and authorising its release. Tyler spoke of his impending retirement and here BTN highlights some of his comments. “Together, we have made the industry safer and more secure by addressing the issues of aircraft tracking and the overflight of conflict zones. Together, we evolved our commitments on climate change into a concrete proposal for a global mandatory carbon-offset scheme. This places aviation at the forefront of industries in addressing its impact on climate change. In doing so, it also secures our licence to grow. Together, we have combined experiences and expertise to build and enhance the standards on which aviation depends. NDC (New Distribution Capability – enabling the travel industry to transform the way air products are retailed to corporations, leisure and business travellers) is a great example. It will modernise the marketplace for air travel. Building on NDC, the next step is the ONE Order programme, which will simplify the customer order and delivery process. Together, with your support we have restructured IATA to strengthen resources in the regions where they are closest to our members and can most effectively meet your needs. In parallel, I personally have focused on the relationships we have with governments and participants in the supply chain. Of course there are some issues where we don’t see eye to eye with our partners. In those cases, IATA works hard to protect your interests. The common theme running through all these achievements is this: Aviation is a team effort. By working together and in unison as partners, we can unlock much more value than we ever could individually.